Please welcome romance author Sara Daniel! Thanks for having me here today. I’m Sara Daniel, and I’m excited to talk about the magical, paranormal world where the Wiccan Haus series is set. The Wiccan Haus intrigued me from the moment I heard Musa Publishing was developing a magical world that was open to submissions. 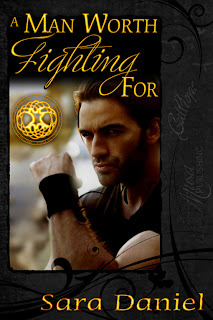 When I saw the cover for the first book in the series, I couldn’t look away from the intense, rugged hero. I bought my copy of Shifting Hearts by Dominique Eastwick as soon as it was available and read it that night. I fell in love with the quirky cast of characters that inhabited this island off the coast of Maine, accessible only by a single ferry boat a week. The world building is consistent between each book in the series. The island is run by four siblings, each with unique powers and fascinating personalities. The rest of the cast of continuing characters are just as quirky and memorable. I fell in love with each one as they took turns pushing my wounded military hero and his ex-girlfriend to grow, heal, and recognize their love for each other. Best of all, I get to revisit the inhabitants and their quirks when I read Kate Richards’ An Apple Away and Dominique Eastwick’s Siren’s Serenade! Thanks for the excerpt, I'm intrigued now. I read this as well as all the other Wiccan stories and have yet to be disappointed. Sara, can you tell us more about the universe of Wiccan Haus? I just won three of these in a contest and am really looking forward to reading them. It's such a great concept and I keep hearing great things about the stories, too. Thanks everyone. Smoking Pigeon, check out this link for the Wiccan Haus. http://thewiccanhaus.blogspot.com/p/rowan-siblings.html This gives descriptions of the 4 Rowan siblings, and you can poke around and find out information about Trixie who runs the deep breathing classes, Myron at the front desk who for the life of her is never wearing the right nametag, and Rekkus the were-tiger head of security. I am such a Wiccan Haus junkie!!! Sara, I was drawn to it for the same reasons you were--the world is so neat and the main cast is so much fun. All the books have been wonderful. In fact, I was rereading A Man Worth Fighting For last night just because it was such a good read and I can't get enough of the shared world. Great book!!! Great post!! !